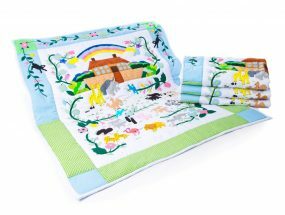 This Blue Counting Sheep Baby Quilt is such a lovely addition to our handmade quilt range with its exquisite border and all those Sheep leaping around! It can double up as a Playmat for the floor or a Wall Hanging to brighten up the nursery wall. 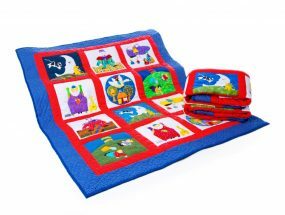 As with all our quilts they are exquisitely hand made in the Philippines by a very talented group of women that we have been supporting for over 30 years. 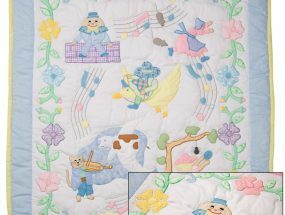 Our handmade blue Counting Sheep Baby Quilt is another work of art with the figures and numbers appliqued onto the material and then hand quilted around. The whole thing is set off beautifully with its patchwork border. It is backed in pale blue material and measures 125cm x 104cm. All our quilts are machine washable but should not be tumbled dried.